A forthcoming film of great interest to modern design enthusiasts this season is Leonie. A portrait of Léonie Gilmour (played by Emily Mortimer) and her life in Japan raising her children Isamu and Ailes during the early decades of the century. The film, presently in post-production, is directed and produced Matsui Hisako (松井久子). Filming took place from April through mid July, 2009. Shooting locations include in Kagawa, Japan, Santa Ynez, California, and New Orleans, Louisiana. It is expected to be released in 2010. 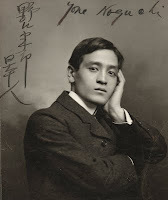 Isamu's father Yonejiro Noguchi (野口米次郎 Noguchi Yonejirō) was a distant, detached figure during this period of their lives in Japan despite Leonie's critical support of his published writing when he was struggling to make a name for himself in the United States. At that time, around the turn of the century, she was his editor, translator, lover and confidant. Her support was essential in his efforts to present his writing to an English speaking audience. 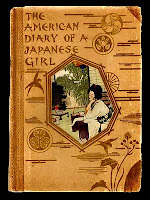 One of Yone Noguchi's early successes was The American Diary of a Japanese Girl published in 1902 after being serialized in monthly installments during 1901. It was purportedly the diary of a "Miss Morning Glory", but presented an outspoken, strong 18-year old woman visiting the US for the first time. The book presented her as the antithesis of the image presented of Japanese woman popularized in stories such as Madame Butterfly. I took a walk in New York's Central Park. And we stepped in the shadow of the trees where no one passed by. And I even promised her many things. And touched it to my mouth. Yone subsequently proposed to (and was rejected by) another American woman writer before leaving the US for Japan in 1904 when war erupted between Russia and Japan despite Leonie's recent pregnancy. He left the US in August 1904. 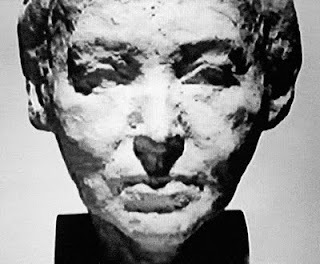 Their son Isamu was born on 17 November 1904. Leonie and Isamu moved to Japan in March 1907 following letters from Yone to Leonie requesting that they join him in Japan. Unknown to Leonie, Yone had already married a Japanese woman with whom he had set up a household. Thus begins the strange, conflicted story of Isamu Noguchi's life. It was a nice surprise to find your blog about LEONIE the film. Please watch the film to find out more about LOENIE and ISAMU. I'm very interested in your film and wonder if you have any further information regarding it's release in America? Will there by two versions: Japanese and English? Thank you for the observant and kind words. Practice, practice, practice, practice -- there is no replacement for putting thousands of hours into something when it comes to self-improvement.